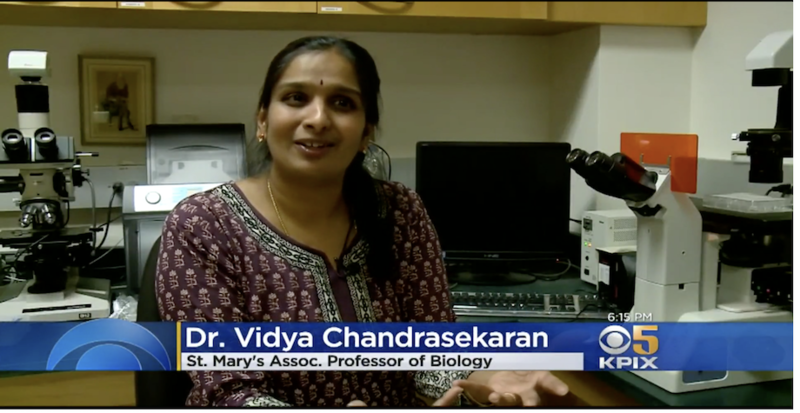 Home / Faculty Experts / Find Faculty By Name & Expertise / Vidya Chandrasekaran, Ph.D.
An Associate Professor in the Biology department of Saint Mary's School of Science, Vidya Chandrasekaran's research includes molecular and cell biology and genetics. Her scientific research also includes examining the impact of energy drinks on tissue healing in animal cells. Recently, Chandrasekaran and three undergraduate student collaborators, co-authored the article, "The effects of energy beverages on cultured cells," which appeared in the "Journal Food and Chemical Toxicology," published by Elsevier. Their research was also highlighted in the online site of "Prevention" magazine in the article "The Bizarre Reason To Skip The Energy Drink" and in the daily online news service "Beverage Daily" in the article ""Top energy drink delays ‘wound closure': US study." Chandrasekaran can address a variety of science-related news topics involving biochemistry, molecular biology, genetics and the impact of highly caffeinated ingredients within energy drinks on individuals, especially young people. She can be reached by email at vc5@stmarys-ca.edu or by phone at 925-631-4251. If you are member of the media and need assistance reaching the professor, or with another news topic, please contact Director of Media Relations Mike McAlpin at 925-631-4222 (office), 925-878-9535 (cell) or by email at mdm5@stmarys-ca.edu.